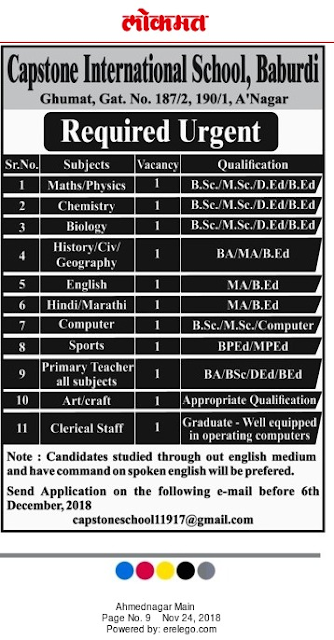 Capstone International School, Ahmednagar has advertised for the recruitment of Teachers jobs vacancies. 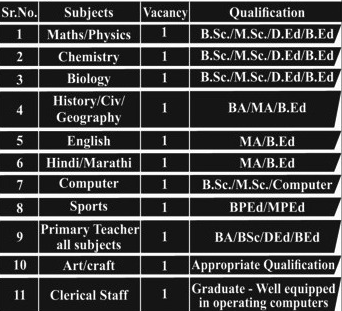 Interested and eligible job aspirants are requested to apply on or before 06th December 2018. Check out further more details below. About School: Capstone High is affiliated to the Central Board of Secondary Education (CBSE) and offers world class education through academic excellence and holistic development. Our endeavour is to nurture global leaders of the future who are curious, compassionate and have the conviction to lead by example. How to Apply: Interested and eligible candidates are requested to send application along with their CV, copies of certificates and recent PP size photos to the following email address. Those have done entire schooling through English medium and have command over spoken English will be preferred.